1 to 8 Players, Ages 5 to 7 It’s a quiet, beautiful day with water lapping at the shore. But a wind begins to stir and some large Waves move slowly toward our Castles. Can we finish all three of them before those big Waves wash in? Let’s gather some sand, share our pails and shovels, and work hard together. This way, we have a much better chance of finishing. But, oh, oh… The Waves are getting closer and closer. 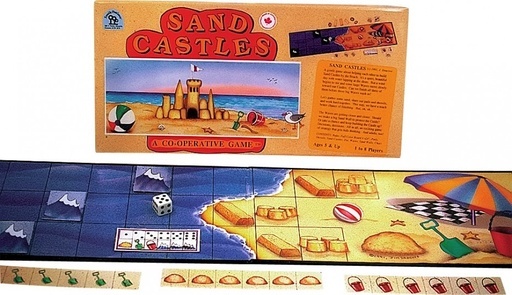 Should we make a big Sand Wall to protect the castle? Or take a chance and keep building the castle up? Decisions, decisions. All in all, an exciting game of strategy that gets us thinking. 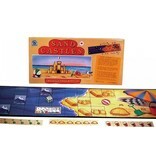 Includes: 6 x 24″ board, pails, shovels, sand castles, waves, snad walls, die, chart.